Wave messages and animations through the air with this persistance of vision toy. Reprogram custom messages or animations by holding it up to your screen! It has 8 LEDs, a beautiful Larson Scanner mode, and is a standalone kit. 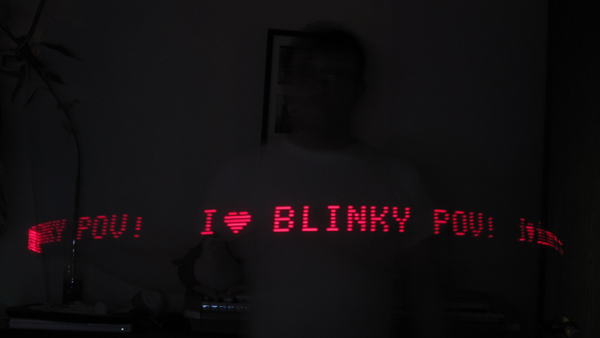 More details are available on the Blinky project page. The kit contains a Blinky POV printed circuit board, battery holder with switch, 8 (and usually one or two extra) red or blue LEDs, a 14 pin chip socket, a preprogrammed PIC16F1823 microcontroller, two 10 kΩ resistors, two ambient light sensors, a 0.1uF ceramic capacitor, and a 6mm push button. The contents are also listed and explained individually on the Parts List portion of the Blinky project page. The Blinky POV is a through-hole kit. It requires basic soldering skill, but has been many people's first soldering experience. At a minimum, you'll need a soldering iron, solder, and a diagonal cutters. It requires 2 AA batteries for red, and 3 AA batteries for blue, which are not included. Clear instructions are available at the Blinky project webpage. It usually takes about half an hour to build, but it may take more or less time depending upon your experience with soldering. This kit is open source hardware. We make the hardware source files like the schematic and the pcb files available for anyone to use as long as they credit us and release any modifications as open source hardware. The schematic and pcb files are available on the Blinky download page.